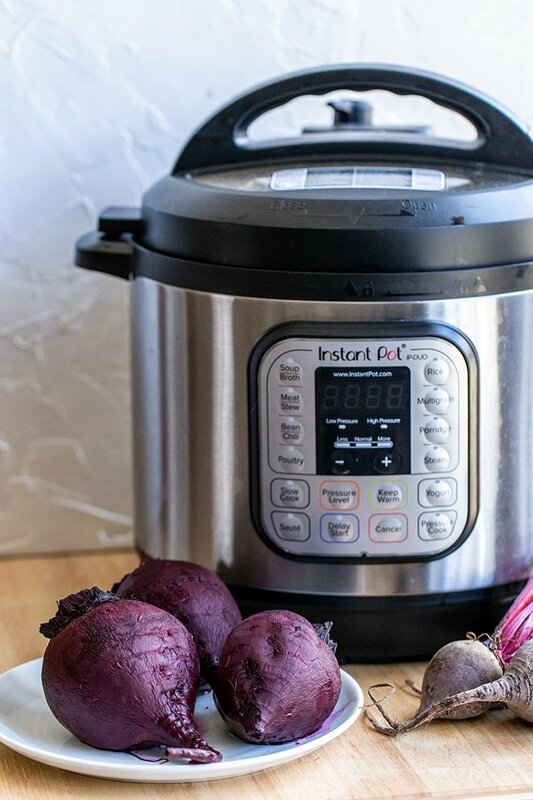 Learn how to cook beets in the Instant Pot. It’s really fast and the skins peel right off after they’re cooked, which means less mess. I absolutely adore beets. Not only do they taste delicious, but the color is just stunning. I always marvel at the natural beauty of them when they’re cooked and cut up like little jewels. I know how to roast beets really easily, but I figured there had to be a faster way to pressure cook them in the Instant Pot. The Instant Pot is my new best friend, these days. I’m known to keep cooked beets on hand so I can whip up a batch of my Borscht whenever I want, or if I have friends stop by I can make some Beet Hummus quickly. The Instant Pot came through again, and I was right! It’s a faster and easier way to cook beets perfectly every time. I’ll tell you how I do it. You want to work with really clean beets. I spend some time scrubbing them, and then I trim off the greens on the stems, leaving about 1 inch. Don’t throw away those greens though, here’s how I cook beet greens – they’re delicious. To cook them, all you do is add some water to the bottom of the Instant Pot and put the beets on in. I pressure cook them for 20 minutes and let it naturally release for a bit before releasing the pressure manually. Once you let them cool to the touch, the skin slides right off. You won’t believe it! Make sure you peel them on a plastic cutting board or over the sink so the mess stays contained and you don’t stain anything. Now you have perfectly cooked beets to use in whatever you’d like. Scrub the beets well and trim the greens off, leaving a 1-inch stem. Place the clean beets in the Instant Pot. Put the lid on and turn the valve to “Sealing”. Select “Pressure Cook” or “Manual” on high pressure and set the cycle to 20 minutes. Allow the cycle to run and let the Instant Pot naturally release for 10 minutes. Carefully perform a manual release. 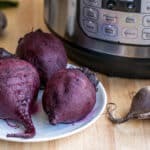 Remove the beets from the Instant Pot, and allow them to cool so you can handle them without burning yourself. On a plastic cutting board, or over the sink, peel the skin off the beets simply by pressing with your fingers. They should slip right off. Serve or store in the fridge for about a week!